The benefits of a propane fire pit are just about endless. They are available shaped as campfires, end tables or just about any other shape you can imagine. For those of you who prefer to stay home, you’ll enjoy the ambience created by their warmth, light and beauty. Even campers who like to rough it and RV campers are enjoying just how easy it is to get a fire going with propane and not have to mess around collecting firewood. Let’s look at the many benefits of fire pits and how they might work out well for you. Propane gas fire pits ignite easily, provide beautiful clean-burning flames and can last all night. 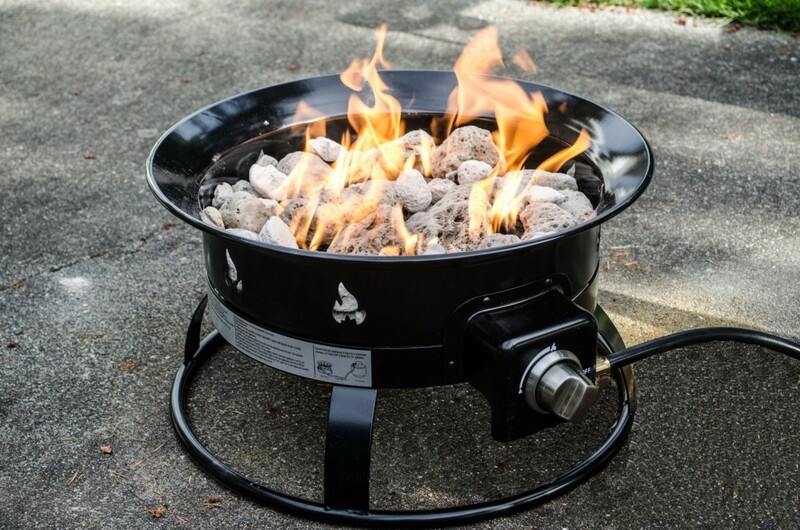 An outdoor propane fire pit doesn’t create dangerous embers, ashes or smoke. Home owners in particular like the fact that they are safe for use on decks, around the pool and perfect for outdoor evening parties. Whether you are a man or woman, you’ll enjoy how easy they are to start with a propane tank. Most only require flipping the switch and pushing the ignition button. You don’t have to buy charcoal or worry about fire wood when the flame goes out. Simply replace the tank and you’re ready to continue with a relaxing warm fire. A fire pit offers features you just won’t find with a camp fire. It can be turned on instantly; there’s no waiting for the fire to build up for warmth. These come with temperature controls and variable speeds, which you can customize to your needs. Options include rustic styling, imitation logs and even rocks. In addition, some designs are made to cook on. Propane gas fire pits are made of masonry or metal structures, to contain a fire to be used outdoors. They provide an attractive look, a heating source and they can be used for cooking. Campers particularly enjoy the cooking feature in addition to warm cozy fires. 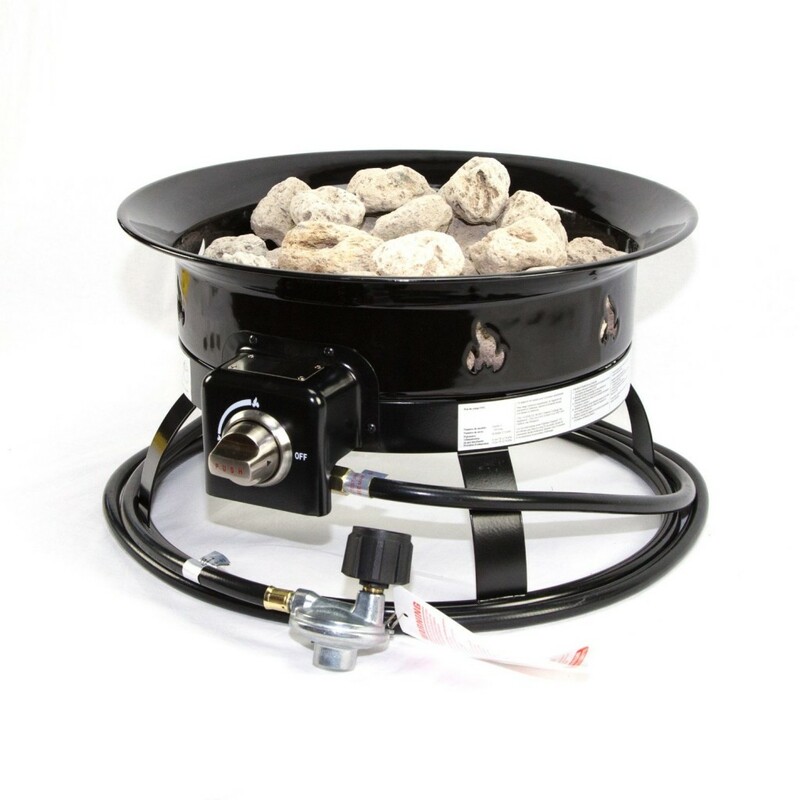 They can be used with propane gas fuel or for home use, connected right into natural gas. Gas fire pits can be purchased pre-built and ready to go or custom designed. The outer structure can be made of fire-retardant resin, masonry, stone or various metals. The interior sections closest to the flame are usually made of porcelain, aluminum, steel or other types of materials composed of heat-resistant metals. Designs are often circular or square in nature and many styles provide seating all the way around. Pits made of resin are formulated to mimic other textures and materials such as wicker or stone. 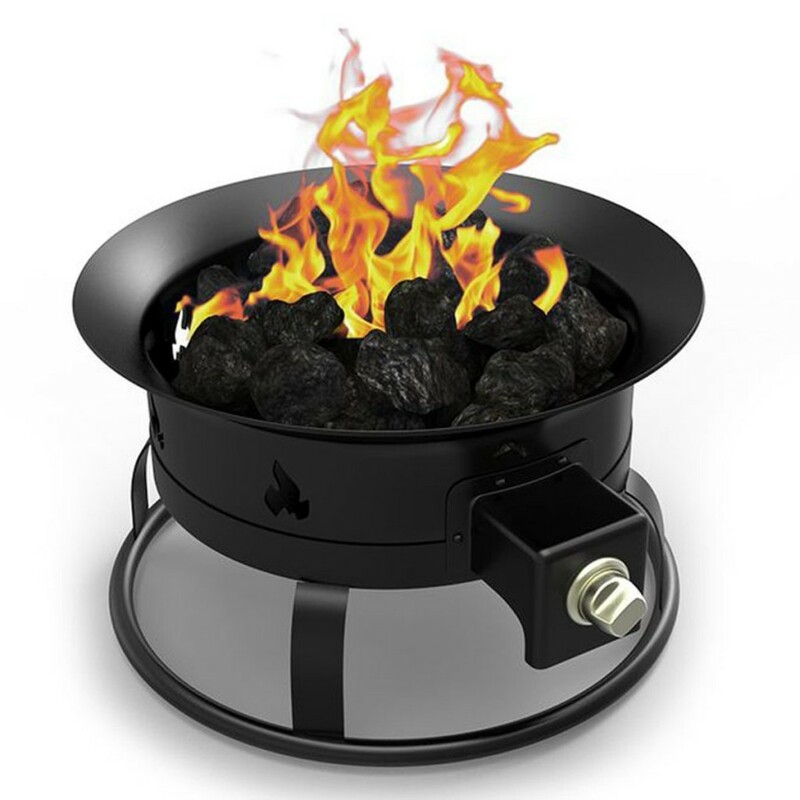 Popular styles include fire pits, fire pit rings and chimneys. Campers can take advantage of all the benefits of using a portable fire pit with a propane tank. These are lightweight, which makes them easy to pack with your camping gear. When you arrive at the campsite, there is no need to go rushing off to look for wood, because your fire will be using propane rather than fire wood. Another advantage to using fire pits while camping is wood is becoming difficult to find at campsite locations and sometimes you have to pack your own wood. Many state and national parks are disallowing the use of fire wood brought into a site, because of insect infestations. This can mean having to purchase wood at the park, which is not particularly appealing to campers. The neat thing about using an outdoor propane fire pit is you never have to worry about trying to start a fire with wet wood. Buy the proper type with a grill for cooking and you’re all set anytime you want to cook while camping. If you intend to camp only a few days at one spot and then move on to another location, just pick up the unit and go. Always follow safety precautions carefully and watch small children around lit fire pits. Select the style which is most appealing for your needs and enjoy a propane fire pit.